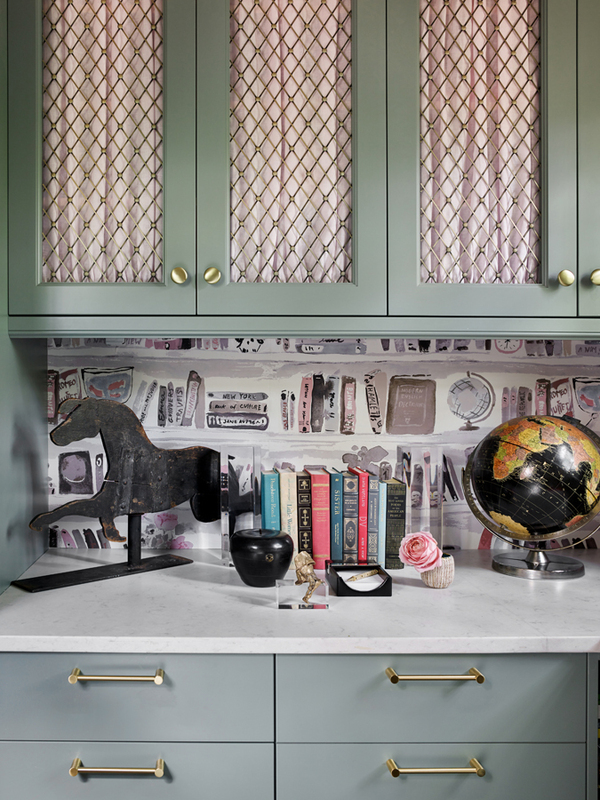 Southeastern Designer Showhouse: "Her Office"
I love Borges’s quote and version of paradise, and when I saw the newly released “Bella Books” wallpaper pattern from the Kate Spade for Kravet collection, I knew it would be perfect for the Office. This wallpaper pattern is everything I love because it is bold and sophisticated, artistically executed, and fun and whimsical. Moreover, the pattern feels feminine with touches of pink, which is so important for the busy homeowner who craved a private space of her own. In addition to the wallpaper, the graphic black and white modern art together with antique silhouettes and sophisticated “Castle Gray” Farrow & Ball cabinetry gives the spaces a refined palette. We also love adding items with history, so the antique clock and the vintage Oushak rug were great complements to the space. With the divine feeling than being surrounded by books and modern art, I wanted the space to be a perfect workspace where creative ideas are born. With so much cabinet storage, and a dedicated surface for organization, life also feels civilized and orderly. When the homeowner walks into her Office, we wanted her to feel good entering her own little jewel box with a mix of accessories and a blush pink ceiling!